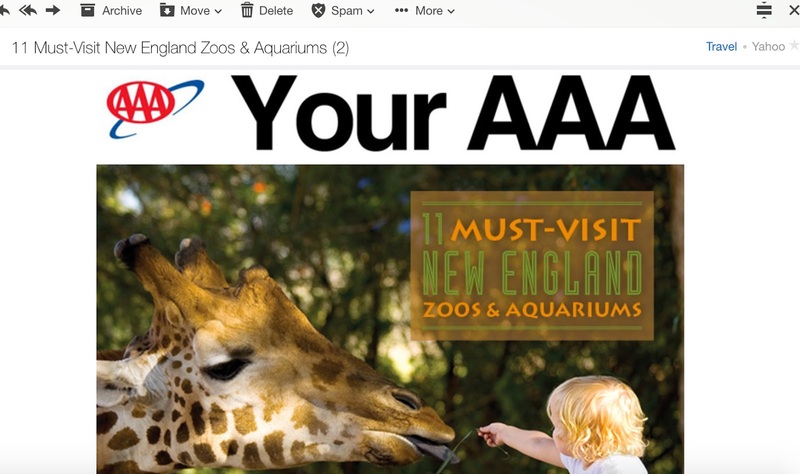 How disappointing to open my email this morning and see the Subject line "11 Must-Visit New England Zoos &amp; Aquariums." Don't you know that zoos and aquariums are antiquated businesses that, at long last, are on the way out? Such places hold wild animals in lifelong captivity. Animals that have evolved to range over hundreds, and in some cases, thousands of miles are now imprisoned in enclosures that severely restrict their natural movement and family relationships. The establishments you tout are a billion-dollar industry built on the suffering of animals — many of whom are intelligent, social beings — who are denied everything that is natural and important to them. And while zoos and aquariums market themselves as places of education and conservation, unbiased studies show that there is "no compelling evidence" for the claim that zoos and aquariums promote attitude change, education, or interest in conservation in visitors. In short, gawking at sad, captive animals does not "educate" people who visit zoos and aquariums, or make them more likely to want to give these species what they really need, which is habitat protection and restoration. While there is still a percentage of people who find these prisons entertaining, that attitude is fortunately waning. And frankly, no humane person would think that entertainment is a good enough reason to justify a life of captivity, regardless of how intelligent (or not) an animal may be. I hope AAA will stop promoting these types of businesses. Instead, why not be creative and cutting-edge and come up with articles offering alternatives to zoos and aquariums? For example, animal sanctuaries, or the best places to go birding or whale watching? You can and should do better. So enlightening! Thank you. Trip Advisor and Expedia have stopped selling activities that exploit animals. They need to go all in and stop selling aquariums too. Ringling Brothers circus is thankfully dead. Sea World is on its way out. AAA needs to get with the program.